According to T. J. C. Williams, History of Frederick County, MD, the original brick Methodist Church in Buckeystown was dedicated on September 15, 1867. It cost $5,000. 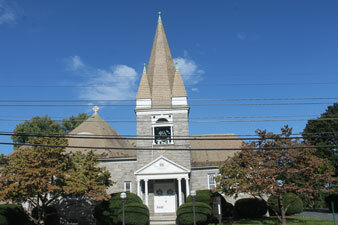 The second church was built of stone at a cost of $16,000 and dedicated in December 1896, The land for this church was donated by Charles F. Thomas and the building is believe to have been constructed under his guidance and that of William G. Baker. The Methodist Church, situated on top of a hill in the south part of Buckeystown, has been a focal point of the community since its construction, being used for suppers, meetings and a polling place. The church is a one and one-half story quarried stone building of worship. It displays a mix of Romanesque Revival and Queen Anne architectural elements. The most imposing feature of the church is the square belfry, which rises from the center of building façade. The entire building is constructed of fine coursed quarried ashlar cut stone. On April 23, 1968, unification of the Methodist Church and the Evangelical United Brethren Church formed the United Methodist Church. Today, Buckeystown United Methodist Church continues to grow and service both its faithful followers as well as the local community.